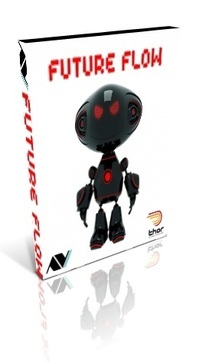 FUTURE FLOW is a collection of 250 new, original patches for Thor. Every patch uses the Thor Pattern Sequencer and goes deep into the polysonic depths of this powerful instrument. Each patch has been built from the ground up using a variety of pattern scales, synthesis combinations, and complex yet musical modulations. Instant Inspiration: The melodies generated by the Pattern Sequencer are sure to inspire and can be used for a wide variety of musical styles including soundtrack, electro, house, pop, and more. Customize To Your Sound: Every note step of the Pattern Sequencer is used in every patch to enable maximum flexibility and user customization options. For example, by assigning rests, reversing, changing pattern length, transposing up or down the midi keyboard, or changing the Pattern Sequencer rate the user can personalize and alter the melodies in many different ways. The Designer: Every one of the 250 patches uses new, unique arpeggiated melodies and patches created specifically for this product by Alan Stuart. The sounds range from mellow bell tones, acid-style lines, raw detuned synth sounds, to beautiful analog-style melodies. Almost every patch uses the mod wheel and 2 Thor rotary knobs for increased expression possibilities. All patches are royalty-free to use in your own commercial or private compositions. Use at your own risk. Patches may not be distributed in any form without permission.